How hip can a tune be? Of course you know this one. It's one of the coolest and bluesiest jazz guitar recordings around. Great for bridging the gap between blues and jazz lovers, which Kenny so superbly does so often, especially on his classic 1963 album "Midnight Blue." Besides, this album is generally seen as a classic example of the "Blue Note" sound and the perfect "late night, neon light flashing outside of the window, cigarette smoke swirling up into nothing" record." The whole album is great and essential listening for guitarists but I will focus on how to play the title track here. Let's first have a look at the sheet music. 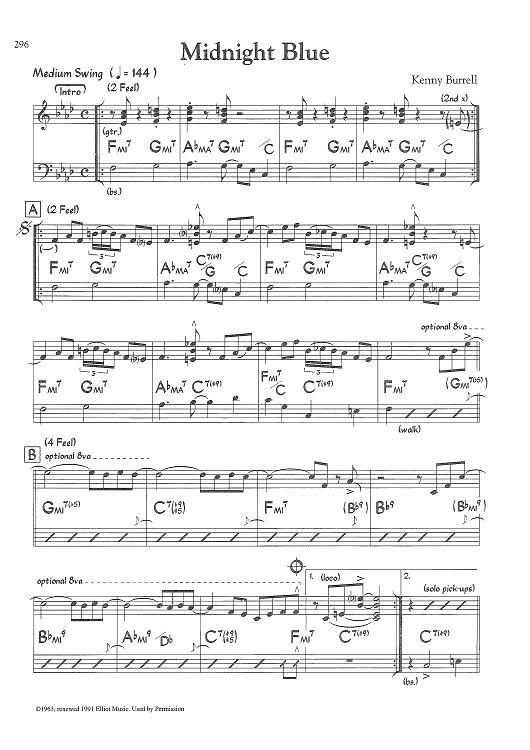 It's a jazz blues in the key of F. Many blue notes in the melody. The head is not that hard to play. Here's an instructional video that tells you how to do it step by step. The exact chord names are not always stated but of course they are all derived from the vanilla changes as given in the sheet music. If you want to play the entire Burrell solo here's a very helpful video with standard notation and tabs. Check it out. I have the video on my computer. I was surprised to find it, but I'm glad I did. You are right, a very good tune for the guitar by Kenny Burrell. Good stuff. Thanks - I've wanted to play this for awhile, very helpful! Question: where did you find the sheet music? I've been looking but not found it anywhere? Looks like it's in a book? I'd love to find it! Same here. The lay out suggests it's from a Real Book? great song, not so easy for me... but is it not in A flat (has 4 flats) ? B-C is slided (1st 8th beat), and B-Bb-Ab is a triplet (2nd 8th beat). And this really differs a little from the corresponding beat in the 3rd bar. Here's a video of someone playing it all the way through note for note. The audio and video quality are excellent, and you can clearly see what he's doing with his left hand. He'll sell you his transcription (notation and guitar tab). I bought it, and it is very good. He also has transcriptions for some other tunes from that album.